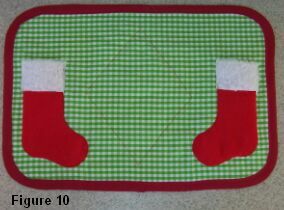 This is such a beautiful and unique Christmas Stocking placemat. 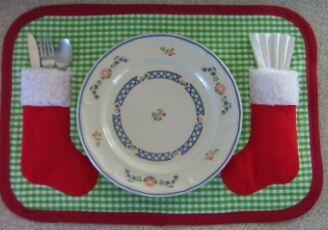 The stockings are the perfect pockets to hold silverware and napkins. Once you've made your own set, you'll want to create more of them to give as holiday gifts! Cut fabric and batting to size. 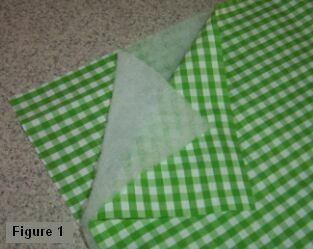 As shown in Figure 1, sandwich the batting between the two pieces of fabric (face fabric right side out). 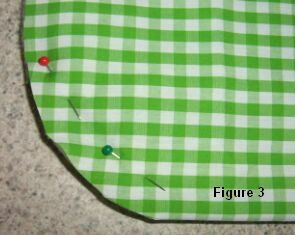 Mark a line at each corner based on a 5" circle and secure with pins (Figure 2). Cut each corner (Figure 3). 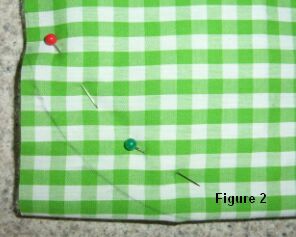 Position binding so that the fold is tight against the collective edge of fabric and batting and pin in place (Figure 4). Sew all the way around. 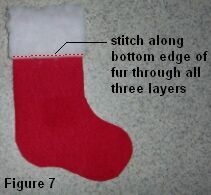 Print the stocking template and cut two stockings from the red felt. 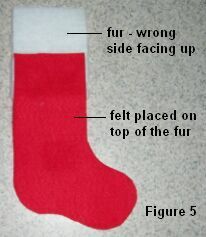 As shown in Figure 5, place the stocking on a faux fur piece. 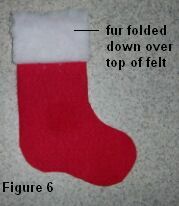 Fold the fur in half down over the top of the stocking to form a cuff (Figure 6). Stitch through all three layers along the very bottom of the faux fur cuff (Figure 7). 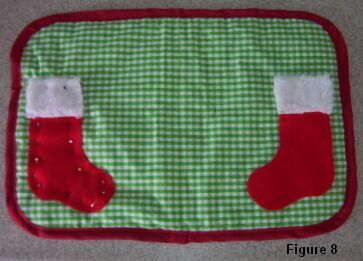 Position the stockings on the placemat and pin in place (Figure 8). Stitch along the outside edge of each stocking, leaving the top of the cuff open. 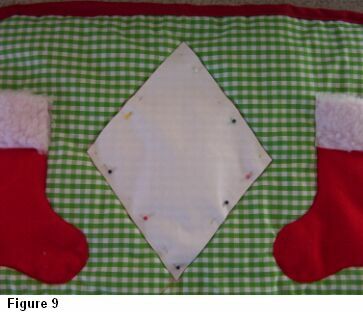 As shown in Figure 9, pin an 11" x 8-1/2" paper diamond in the center of the placemat. Using the edges of the diamond as a guide, stitch just outside the diamond all the way around. Remove the paper diamond. 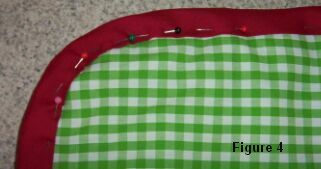 Iron the fabric and binding portion of the placemat. Repeat instructions to create the total number of placemats you need.